On Tuesday, Fannie Mae and Freddie Mac reported Mortgage Delinquencies Rose 50% in a Month. Those are pretty nasty numbers. Mark Hanson (aka Mr. Mortgage) at The Field Check Group said "We saw this coming well in advance by watching notices of default (NODs)." Fannie and Freddie data is woefully late. The GSEs are just now reporting January delinquencies. In the meantime, Mark is tracking actual notice of default data (90-120 days late) for March. If defaults are soaring, it stands to reason that delinquencies will be soaring as well. In this way, someone watching Notices of Default (NODs) is able to know in advance whether or not an upcoming GSE report is going to be bad. Mark is also tracking California specifically. Please consider the following chart. A key point for the above charts is that Fannie and Freddie loans are now blowing up at a faster rate than the entire universe of loans! Mark's data is for the west coast, primarily California. However, his assumption is that if his west coast data is bad, the overall numbers for the GSEs will be bad as well. Note the effect of SB1137, a ridiculous foreclosure prevention act that gave give delinquent payers 30 days grace period before the actual foreclosure process begins. All that bill did was add red tape and delay the inevitable. A new CA law dubbed the CA Foreclosure Prevention Act comes into effect in July that will essentially do the same thing. It's primary purpose is to delay the time between the Notice-of-Default (foreclosure stage 1) to the Notice-of-Trustee Sale (stage 2) by 90-days further delaying the foreclosure process and ultimate end of the foreclosure and housing crisis. Hanson says, "It is likely we are already seeing unintended consequences of the new law. 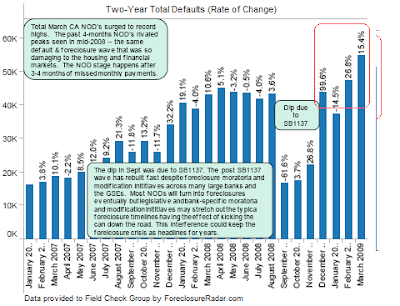 A certain percentage of the last few month's surge of new loan notice-of-defaults was likely servicers gaming the calendar in order to get borrowers into the foreclosure process prior to the July enactment of the new law." Since late November, the Enterprises had suspended foreclosure sales and evictions on owner-occupied properties. The suspensions, which ended on March 31, 2009, allowed servicers additional time to work with borrowers in foreclosure who were eligible for the Streamlined Modification Program (SMP). The impact of the suspensions caused completed foreclosure sales and third-party sales to decline 77 percent from the prior three-month average of 16,342 to 3,711 in December, and 79 percent to 3,391 in January. At the same time, loans that were 60+ and 90+ days delinquent increased. All loans 60+ days delinquent increased from 834,831 as of November 30 to 1,229,051 as of January 31, representing an increase of 47 percent over the period. However, prime loans 60+ days delinquent increased by 69.6 percent while nonprime loans increased by 23 percent. The reported 743,686 in the first widely read article was only Prime loans. The total 60-day and worse delinquent/defaulted loans stood at 1.229 million as of Jan 31st from 834k in November, up 47%. This represents 4.1% of their entire portfolio. This was led by prime that was up 70% while Subprime was up 23%. Successful loss mitigation is increasing BUT in January only 9k loans were successfully modified. That would have to increase 10 fold to make a dent in the upcoming foreclosure wave. 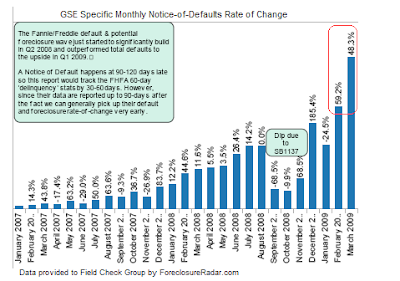 The multi-month foreclosure suspension that ended on March 31st came at the same time as the new GSE loss mitigation initiative -- but with a 400k increase in distressed loans over the past 2 months and a recent record of 9k mods per month, the broken dam has a lot of water coming over it. It's no wonder why the Fed is buying Agency MBS. Foreigners are likely a tad worried about now about this trash they were peddled by the trillions carries no explicit guaranty. Please consider the MBS Purchase Program. On Wednesday, March 18, the FOMC announced the expansion of the Federal Reserve's program to purchase agency MBS to a total of $1.25 trillion by the end of the year. Does the agency MBS program expose the Federal Reserve to increased risk of losses? Assets purchased under this program are fully guaranteed as to principal and interest by Fannie Mae, Freddie Mac, and Ginnie Mae, so the Federal Reserve's exposure to the credit risk of the underlying mortgages is minimal. The market valuation of agency MBS can fluctuate over time based on the interest rate environment; however, the Federal Reserve's exposure to interest rate risk is mitigated by the conservative, buy and hold investment strategy of the agency MBS purchase program. When did the purchases begin? Purchases began in early January, 2009 and will continue until the end of 2009. Defaults and delinquencies are soaring an the Fed has the gall to say there is no risk because the principle is guaranteed by Fannie Mae and Freddie Mac. 1. 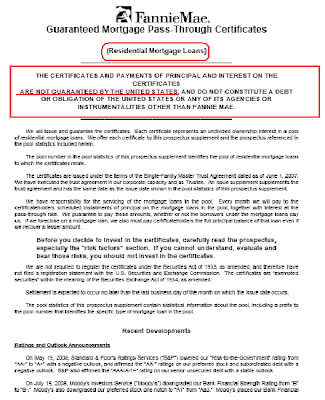 Exactly who is guaranteeing Fannie and Freddie? 2. How the hell does the Fed think it can get away with such a blatant lie about the risks? Risk. Treasury is committed to protecting taxpayers and will ensure that measures are in place to reduce the potential for investment loss. Under most likely scenarios, taxpayers will benefit from this program - both indirectly through the increased availability and lower cost of mortgage financing, and directly through potential returns on Treasury’s portfolio of MBS. Any idea that taxpayers will benefit from gains on the MBS portfolio is complete nonsense and the Fed and Treasury both know it.